SEO vs. PPC - Which Provides You the Better Value? Organizations of all sizes are realizing the importance of online marketing, especially through search engines. Nowadays, people are more likely to end up on your website via a search engine than going directly to it. In fact, according to Jupiter Research, a Forrester Research company, 81% of users find their desired destination thr ough a search engine. This research makes it clear that it's very important for your brand to have a strong presence in the search engines, ensuring that you're in front of your target audience. However, there's still a big decision to make - whether to use SEO (Search Engine Optimization, or naturally ranking high in the organic results) or PPC (Pay-Per-Click ads, the Sponsored Links and purchased ads on a Google search) to get in front of your target? Done correctly, both can get you on the front page of the search engines for targeted terms and in front of your desired audience. However, each has its respective benefits and costs. SEOmoz, a great SEO resource, recently published an article by the team at Enquisite quantifying the effectiveness of SEO vs. PPC. The article details that organic results are 8.5x more likely to be clicked on than paid search results! That's a large disparity and is likely attributed to searchers gradually learning the difference between organic and sponsored results, and recognizing that organic results are typically the more respected resource. Also, researchers have used heat maps to show that searchers' eyes focus on the top organic results, with people barely noticing the ads to the right. However, PPC holds a slight edge in conversion rates, as paid search results are 1.5x more likely to convert click thrus from the search engine. The SEOmoz article attributes, to the fact that the paid search result's "text and landing page is custom optimized by the advertiser." So, looking at both of these numbers, it can be concluded that "the opportunity from organic search is 5.66x that of paid search." So, given the flat out choice of ranking high organically or having great PPC ads - the overwhelmingly logical choice is organic. However, we all know it's not that easy or else those "Rank #1 in Google TOMORROW" robo calls would be much more effective. True SEO takes time, not get rich quick schemes. PPC's true strengths are its speed and expansiveness. With a PPC campaign, you can be on the first page for a multitude of targeted terms within a day. However, the terms can cost anywhere from pennies to many dollars per click; also, for a PPC campaign to be done correctly, it's usually best to hire a firm that can manage it full time. This can mean that PPC campaigns can get very expensive, very quickly - especially when done correctly. SEMPO, the Search Engine Marketing Professionals Organization, estimates that 87% of search engine dollars are spent on PPC vs. 11% spent on SEO efforts. That's more than $10 billion spent on PPC vs. just $1 billion spent on SEO. That means the strategy that's over 5x more effective, SEO, is only receiving 1/8 the media spend in the market! It's hard to justify the expense of a PPC campaign, knowing that SEO is more successful and the overall better longterm value. Don't get me wrong, there are certainly times to use PPC - when you're first launching your company, it's a great way to get your name out there and build brand awareness. For a limited time offer or special event, PPC is an effective way to get exposure that SEO wouldn't have time to contribute to. Also, PPC is more effective for products than it is for service companies; for example, we focus SEO efforts on terms such as Raleigh web design and Content Management Software; however, we do not engage in PPC advertising for these terms, because they're usually a waste of money for a services firm like ours. Yet we have an electronic payments client that runs a PPC campaign focused around its specific product offerings, and this strategy makes sense for their market. However, when it comes to the long term lifeline of your internet marketing, the result is clear - SEO offers the better value in search marketing. You won't rank #1 overnight, but SEO is more affordable and the longterm benefits have been proven. All of these facts demonstrate that your company should spend more of its time and resources focusing on SEO vs. PPC. What are other people's experiences in this realm? Anyone think that PPC is the more value-driven choice than SEO? Let us know your thoughts! This research doesn't take into account average order value or the likelihood of the customer to become a repeat buyer. I'm not saying the research above is wrong, but I did read a study in Direct Magazine earlier this year that showed paid search did edge out over organic when taking these things into account. I'm not vouching for the validity of that research, I'm just saying this research could be biased as well since it is put out by an SEO organization. It'd be nice for some truly independent research that covers CPC, CPV, average order value, value per visitor, and lifetime buying patterns of each type of customer. Thanks for the comments!\r\n\r\n@Trevor - very good points. As I noted in the post the speed and expansiveness of PPC are valuable - especially for marketers with specific goals. So, for companies with large marketing budgets, it can be worth it to run PPC campaigns, however, they should always be striving and dedicating resources to SEO too. Too many large firms just do PPC and figure that it's enough coverage.\r\n\r\n@Ryan - First, sorry for the SPAM Alert message on your comment - our SPAM protection gets a little over zealous at times. Average Order and Repeat Buys are two very interesting criteria that I'd love to see statistics on. I'd be wary of how the study was conducted though - since PPC is best for products, it makes sense that there would be repeat buys on PPC conversions, whereas good SEO may be for a services company only looking for a one-time purchase. If you have the study, send it over, I'd be excited to see it. Also, while this post was heavily based on SEOmoz, all of the data was gathered from SEMPO, which is a relatively independent source. \r\n\r\nThanks for your thoughts! I am not clear why PPC is good for products while SEO for services. You mean if I do SEO for my products, It is not as good as ROI from PPC? The right choice for website depends on particular needs and desires. Most websites get benefit mostly from utilizing a combination of these two approaches. Using PPC marketing can help quickly identify your best performing keywords, while implementing a longer-term SEO strategy will increase chances of ranking well in the organic listings to get long term good traffic. Thats a great observation. Depending on the purpose of your site, PPC can be a good choice. Also, I think PPC can be effective to target periphery terms that you might not target through blogging or that just may be hard to win. So, while Staples should not pay for ads for their name, they could do well buying the phrase "buy pens online." There is definitely a time and place for both PPC and SEO, but SEO will offer the best long term gains at the least cost. 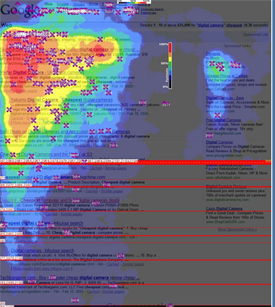 While I am certainly an advocate for implementing a comprehensive online strategy that *includes* SEO, the heat map example used above clearly shows a bias towards SEO. The majority of the time, SERP's will place the top 3 PPC ads right in the "hot-zone" represented above, top-left portion of the page. In addition, the previous comments of a more detailed report that includes the ultimate result of these clicks is what any business owner interested in profit margins should be concerned with. I always wonder when people talk about PPC vs SEO as if both cannot coexist. PPC is used for one thing, strategic advertising, and SEO is an ongoing process of optimisation. The best companies spend time, and money on both. Thanks for the feedback! You're correct that the top spot on that particular image is a sponsored result, but I don't think that fact "refutes a lot of this" article. As you point out, people are going to look at those top results due to the way humans read -- the top spot could be a sponsored ad or it could be organic. Just depends on the term. Organic can guarantee you a spot up there without the cost. Furthermore, the rest of the facts in the post still hold true, independent of that image. Conversions, click thrus, etc. are still statistically better with organic rankings than PPC. Very interesting read, and as some people pointed out, it would be very interesting to see the true benefits of both. I think we all know that long term seo is going become (hopefully) a cumulative gain, for lower costs. There can be a lot of factors to take into accounts, yes you can niche very specifically via ppc to certain targets, but there'Rs nothing to say you cant do that with your seo also. Take a leaf out of facebook's business plan, and target the other keywords and dominate first. Increase your traffic and roi from that and use to reinvest into the more difficult terms. Very good article. AdWords can be very dangerous if you just start a campaign and hope for results- you'll lose a lot of money and end up bitter that way. Make sure you constantly watch and adjust your campaign. Yes it is, It’s my personal experience. Till 2013 my business was only in local market, just offline. I made a website just for showing designs and dress models to my customers. YNG media approaches me for SEO and social media of my websites. First I was not interested because it was going great but only because of my friend I agreed. Can you believe what I got? SEO and social media increased my sells almost 200% and I was like WOW…. So from my side. Always go for SEO. Thanks for this. One of my challenges has been to offset the AWFUL damage that the overseas "marketers" have done on people trying to learn/do SEO. For example, many people have a bad taste int heir mouth for the term SEO and are likely more trusting of paid traffic since it might seem safer. Regardless, seeing some solid numbers on the matter might help me convince some people that my services are a better use of their marketing dollars. I have used ppc for a good few years now. I find it very expensive. I do not get the number of new customers that the clicks I pay for would suggest. I am diligent in weeding out negative keywords. I have often thought that competitors would use up the budget on clicking through to the website, The problem is I do not trust SEO organisations - certainly not the overseas ones that seem to permanently be on a hard sell. Google are always tinkering with the adwords process as well so it is nigh on impossible to 100% understand how everything works. "The Search Engine Optimisation or SEO industry has transformed immensely over the last few years, and the experts have several reasons to believe it might grow indefinitely in the future. Understanding SEO is crucial to significantly increase your traffic and brand awareness. People don’t want to be left behind by not knowing the latest trends related to SEO. Your blog will surely help bloggers have a better understanding of SEO related topics. A huge misdirection in the PPC v SEO debate is that organic results get 8.5X the clicks of PPC ads. That might be true, but 90% of all searches have no COMMERCIAL INTENT ie., the searcher is not looking to buy a product or service, the searcher is imply looking for information. Smart PPC agencies and advertisers specifically target searches with commercial intent and use negative keywords to prevent ads showing for searches that are unlikely to result in a purchase. So, PPC ads may not show for 70% or more of all searches which means that, of course, organic results are the only option and therefore they get a higher % of overall cicks. Research shows that for searches with commercial intent the split between PPC and SEO is close to 50/50 overall and that is absolutely no surprise because with 4 ads now at the top of the page enjoying more space with callouts, sitelink extensions etc., and local listings appearing below PPC ads - organic listings are being pushed further and further below the fold. Another complete fallacy is that many searchers avoid PPC ads because they are less relevant. That may have been true a few years ago but not now. Google's quality score has seen to that. Google will do everything in its power to motivate more clicks to PPC because that is where it makes money. It is constantly rewarding PPC advertisers who provide a relevant and great landing page experience and is doing absolutely nothing to help and aid those companies relying on SEO. SEO is more cost effective in the long long as opposed to PPC. Something rather fascinating is that a few months ago, it was easy to do a google search for 2018 PPC stats. However, performing the same search today, I found it difficult finding the data. It’s as though all these companies selling PPC services have flushed out the previous data. The fact remains, in 2018 people are far more savvy and have become immune to google ads, scrolling past in search of real results. Irrespective of stats showing more using them, this relates to companies’ spending, not users’ habits. Very Informative post, even I had this query in my mind what to prefer ppc or seo, then I came across a blog post clarifying which is better Paid results or Organic ones. Nice article. Great informative blog. Thanks for sharing.